One measure of intelligence is the ability to view objects in new ways—not limited to their original design or purpose. Acting classes develop an expanded view of the world by playing improvisation games with props or properties. Each actor must quickly use a common item in an unanticipated way. Of course, you don’t have to be in an acting class to be called upon to come up with new uses for whatever is on hand. Life smirks when you don’t have what you need when you need it. Our most recent experience with what some have called “the McGyver effect” occurred on a spur of the moment road trip. Because my husband and I hadn’t planned to travel at all, he hadn’t checked over our car. But once we were hours from home, he felt inspired to see if we had sufficient oil to make the return trip. He raised the hood of the car and cursed. In the preceding weeks, we had been burdened with a bill of several hundred dollars for a tow and repair to our pickup truck. Mice or perhaps chipmunks had chewed the cables to the alternator. Without a functional alternator, the car is a no-va (Spanish for doesn’t go and one reason the popular Chevrolet model didn’t sell well in Mexico). My husband’s curses about our car meant the mice had dined on more than the pickup truck. We were hundreds of miles from home depending on cables that had been a snack. The good news was the mice hadn’t progressed beyond removing the shielding around the wires inside the cable. “Do you have electrical tape?” I asked hopefully. More cursing. No, we didn’t have electrical tape. My husband considered the situation. 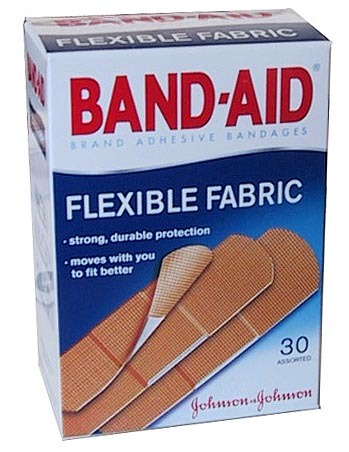 What we did have was a first aid kit—old and missing parts, but still stocked with Band-aids. And so, we completed a successful drive home thanks to several Band-aids wrapped securely around our wiring. A friend told me that the only way to deter the chewing of mice was to install a radio playing 24/7 near the site of the vehicle to be protected. In the past, my husband and I have tried potpourri, stinky soap, mothballs, and traps baited with peanut butter. Aside from some small carnage due to the traps, we failed miserably. But at this moment, our garage sounds like an endless party. (Happily, we don’t have close neighbors—other than wildlife.) I imagine rodents dancing and playing air guitar. Whether they are driven away by repeated renditions of “Roxanne” (a favorite on our local radio station), remains to be seen, but we’re hopeful. This entry was posted on October 3, 2015 by Personal Journeys with Gramma in Life Stories and tagged Adapting to the Unexpected, featured, Life Stories, Living with Wildlife, Make it Work, Making Do, McGyver Effect, Music Keeps the Mice Away, Musical Garage, Nature Problems, Use What You Have.